On July 20, 1944, a bomb exploded during a meeting between senior German military officers and Adolf Hitler in a conference room at Wolf’s Lair, a high security site near Rastenburg, in what was then East Prussia. It was the most famous of the attempts and plots to kill Adolf Hitler. As did all the others, it failed, though Hitler suffered serious injuries which plagued him over the ten remaining months of his life. It also set off a wave of “trials” and executions of those involved in the conspiracy. Several generals and other officers were executed or offered the opportunity to commit suicide in its aftermath, as with Field Marshal Erwin Rommel. That assassination attempt was part of a failed coup to depose Hitler and negotiate peace with the Western Allies. It remains the most famous attempt on Hitler’s life, but it was far from the only one, both while he was in power as head of the German state and before he achieved that status. There were numerous plots to kill Hitler, using various means, among them poisoning his food, causing his airplane to crash, bombs, shooting him, and even stabbing him. While the majority of the plots were to have been executed within the boundaries of the Reich, there was at least one scheme to kill Hitler in Warsaw, and another in the Ukraine, neither of which were put into operation. The Gestapo and SS security broke up several other plots against Hitler which never saw the light of day. It isn’t possible to list all of them within the bounds of this article, but here are some of the plots and assassination attempts directed against Adolf Hitler. 1. Numerous attempts were made during Hitler’s rise to power. 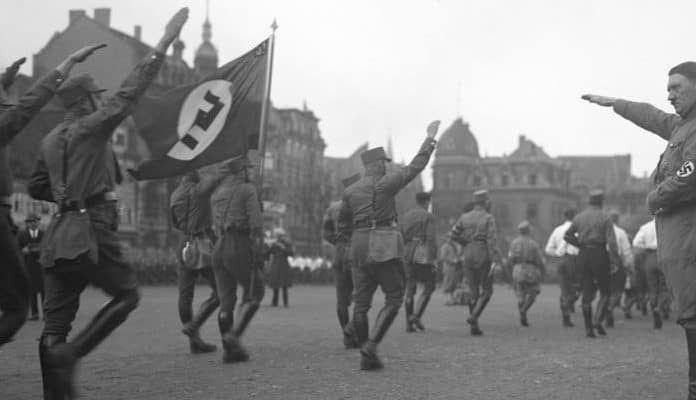 In the early days of the rise of the Nazi party, its rallies were notable for their rowdy audiences, and its demonstrations in the streets frequently descended into violent clashes with communists and other opponents of National Socialism. So it is no surprise that Hitler frequently was exposed to violence during these events. As early as 1921 shots were fired from the crowd in the direction of the platform on which Hitler was speaking; no one was injured and the assailant was never identified. Shots were fired at Hitler in Thuringia and in Leipzig during the 1920s, including at his car as he rode through the Leipzig streets, though again no injuries were sustained and nobody was arrested for the assault. Hitler used the repeated attempts to amplify his dedication of his life to the German people and nation. In 1930, after dining at the Hotel Kaiserhof, all of the staff who joined Hitler for the meal were stricken with the symptoms of severe food poisoning. Hitler too was taken ill, but his symptoms were far less severe, likely because of his vegetarian diet, which caused him to avoid meats and many sauces. Yet again, no culprit was found. None of the staff was fatally stricken in the attempt to poison Hitler, if in fact that is what it was. In other attempts which occurred before Hitler achieved the Chancellor’s office, shots were fired at Hitler’s car in the streets of Munich, Nuremburg, and even in Berlin. The Gestapo later learned of plots to kill Hitler in his car using a grenade, in a manner similar to that used to attack Reinhard Heydrich in Czechoslovakia. On at least one occasion shots were fired at Hitler’s railroad car as he traveled with Wilhelm Frick and Joseph Goebbels; once more no arrests were made.